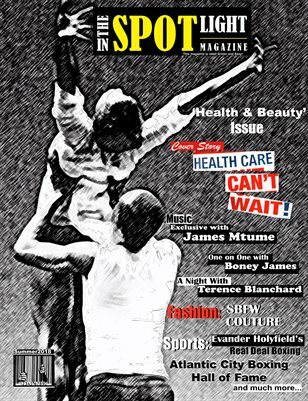 In The Spotlight Magazine, Issue 16, Health and Beauty, In This issue Cover Story 'Health Care Can't Wait' along with Fashion, Make up Tips. Music Exclusive with James Mtume, Boney James, Terrence Blanchard, Indie Artist and I.T.S. Legends In The Game. Sports Boxing is Back in Jersey with the 2nd Annual Atlantic City Boxing Hall of Fame Induction Weekend, Championship Boxing from Brooklyn, NY. and much, much more!